So you have made the move into Office 365, you have ADFS so you can have a single sign on so your user do not need to worry about logging in when they are in the office but it is not working, you check your ADFS setup and it looks good once you users logon in the morning they are good for the day so what are you missing? There are a couple of setting that you may need to look at. You will also need to change one of the settings in the advance settings tab in IE. 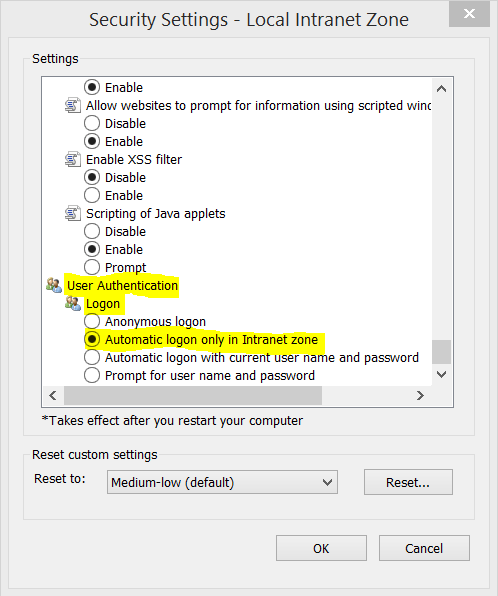 Internet Options >> Security >> Click on the Local Internet zone >> click on the “Custom level…” >> User Authentication >> Logon >> Automatic log-on only in Intranet zone. This set of settings can be deployed via an AD group policy if needed.